This Ball Shooting Burp gun provides great fun but without the risk of putting someone's eye out. It uses air-powered pump action and holds 12 plastic balls which can be fired individually or in groups. This gun makes a playful burping sounds everytime it's fired. 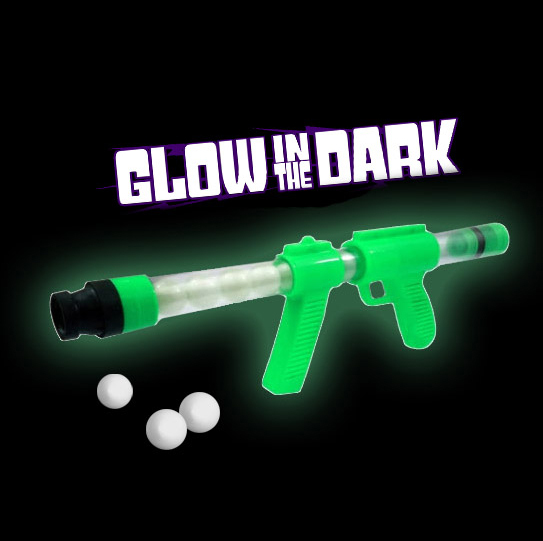 Plastic Glow-In-The-Dark Moon Blaster Gun. Just pump and aim. Includes 1 dozen plastic 1" (25mm) balls. (1 pc./PBH) 19"